> Type a name for your DSN. 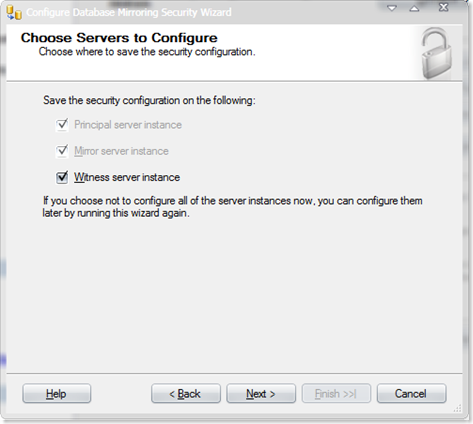 > Type the server name or IP Address into the Server text box. 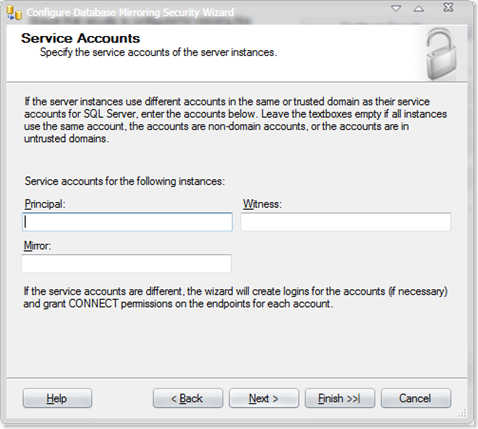 > Type the username needed to connect to the MySQL database into the user text box. > Type the password needed to connect to the MySQL database into the password text box. > Select the database you want to be able link to. > Enable OPENROWSET and OPENDATASOURCE support. Seems as though not everything is exposed properly, your not going crazy! 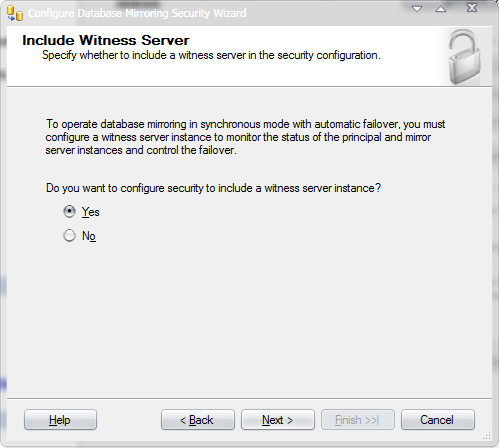 Is it worth upgrading to SQL 2008? I had downloaded and played a little with the SQL2008 CTPs, and the new features were impressing me, although it appeared that SQL2008 was a development of SQL2005, as SQL2000 was a development of SQL7 despite comments to the contrary. New headline features included backup compression, governors, policy framework, data compression, encryption, change data capture etc. But then I read the recently produced Microsoft documentation on version differences and see that none of them are in Standard edition, not one. They are all Enterprise features. SQL server may be moving more towards a data platform from just a database engine, but the platform appears to be somewhat narrow for non Enterprise users! This posed a question – is it worth upgrading from SQL2005 Standard edition to SQL 2008 Standard edition? 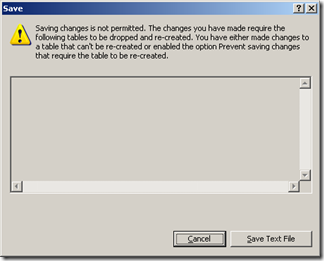 Maybe we have been spoilt by Microsoft ‘giving away’ too many new features in the upgrade from SQL2000 to SQL2005. The potential performance/scalability differences between a say 32 bit 2 GB RAM SQL2000 Standard on NT4 Server and a 64 bit 32 GB RAM SQL2005 Standard on W2K3 Standard system is very large indeed, despite both the OS and SQL Server version being the Standard edition (a likely OS/SQL combination). SQL2005 Standard offered such new goodies as clustering, unlimited RAM, mirroring (safety always on unfortunately), and log shipping – the unlimited RAM (to OS max) was a real eye opener when I saw the specification sheet, although the price of RAM made such levels of RAM just a paper exercise for typical Standard edition users. That is no longer the case, as RAM is now much more affordable. I would have capped the RAM on SQL2005 Standard edition to around the 8 GB mark, allowing an increase to say 16 GB in SQL2008. The 4 processor limit was a good selection IMO, although I can see disk IO being far more of a bottleneck in most servers of this specification. SQL2005 Standard (still) did not support indexed views during optimisation, but I can afford to learn a bit about ‘noexpand’ with the money I had saved and still use the feature when required. As for partitioned data, that was ‘just for people with terabyte databases’ and data warehousing, and I would never see that sort of disk IO anytime soon. One feature that would have been useful was database snapshots, but I could see they would need to differentiate the versions. The parallel indexing I could live without too. They even threw in the (little used) CLR and service broker, and the (doomed) notification services. One of the subsystems that I frequently use very heavily, merge replication, had so many new features in SQL2005 I could hardly keep count. 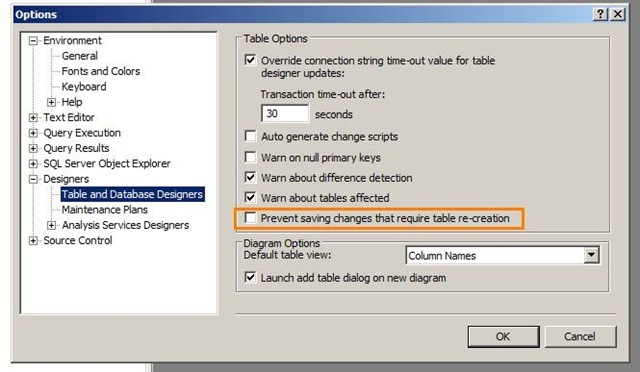 I could also see on paper improvements for DTS/SSIS and reporting, but had written my own systems many years ago when SQL Server did not have them, so cannot comment on their improvements in practise. Upgrading from SQL2000 Standard to SQL2005 Standard provided many new features. I remember the discussion at the time, when many thought that SQL2000 was good enough for many applications. I still think that is the case today to be truthful, but have used quite a few of the new SQL2005 features over the last year or two. However, let’s look at what SQL2008 Standard offers over 2005 Standard. There are no processor or RAM improvements, not that they are required any more. Mirroring looks like it might be improved marginally. I am really peeved to see that backup compression has not made it to the Standard feature list. 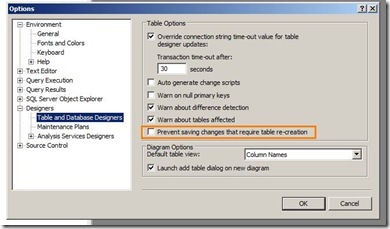 There are the usual incremental improvements in SSIS and Reporting, again which I do not use. To cap it all the (to me) business critical merge replication has gained no features, but its growing deprecated item list makes it look more like it’s on the way out than moving ahead. The new sync services look interesting in the longer term, but offer nothing except a likely version 1.0 buglist for those wishing to take the early adopter plunge. With the massive increase in the number of Enterprise features I would have thought it would make great sense to throw in a few of the ‘old’ Enterprise features into the Standard edition – database snapshots would have been nice, or lock pages in memory. Forgive me if I feel short changed, but that feature list does not look a great reason to upgrade. Or I have I failed to turn over the magic stone with hidden features? So I am left looking at programming/development enhancements – date/time fields, HierarchyID, spatial, merge SQL statement etc. Nice but not critical. There are 2 features that have gained relatively little attention but might improve application performance dramatically for the applications I see – optimize for ad hoc workloads, and filtered indexes. It appears on the surface that these features apply to all editions. So I am left with the question of whether to upgrade, or wait till the next version of SQL server. Or in the longer term investigate ‘cheaper’ alternatives such as MySQL, which will become ever more viable as the performance of hardware hides any performance deficiencies (either perceived or real). Bearing in mind I have ‘free’ upgrade rights within our Microsoft licensing agreement, I would be very worried if someone that can upgrade for free cannot see the benefits of using the new version. A related topic is that the CTP’s and developer versions of SQL Server are in effect Enterprise versions, with all the features always on. I can understand this (particularly with the CTPs), but surely it must be simple to add a switch to tell developer version which edition you wish to emulate, so it is possible to develop against the edition that will be used in production. This problem was annoying in SQL2005, but the feature is critically required now, with the vast difference in feature set. I see that there is now a management view that tells you which Enterprise features need to be dropped to use a database in Standard edition. It could be that Microsoft has done their homework well, and are really targeting the ‘Enterprise’ customer, and are less concerned about the Standard version than they were a few years ago as SQL Server moves more upmarket. I think that Microsoft should make sure that everyone gets something from upgrading, not just being forced to do so as the support for the older product eventually runs out. If they don’t provide improvements I can see slippage of SQL Server customers at the lower to middle range products. Of course, if you run SQL 2000 Standard, upgrading to SQL2008 Standard (or maybe workgroup depending on which features you require) would be a great upgrade. Or am I already getting good value for money and should just be pleased that I am running a very reliable database system, and be happy to pay extra if I need any of the new features. So I said some undocumented changes, well at least I think they are undocumented, I have not yet come across any reading about them. 2. This is documented but worth bringing up powershell integrated with SQL 08, whilst we could powershell with 05, its just made it a little quicker by allowing us to click on the database we want to start powershell in, just another time saver. 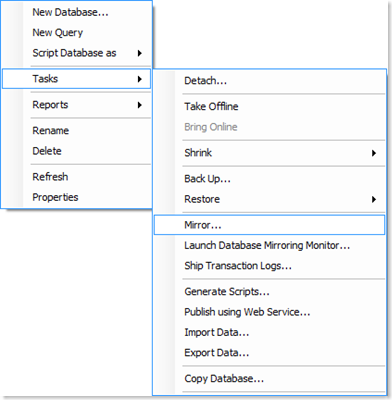 there are some other small functions that are helpful, which is across the most SQL 08 range. I am also VERY disappointed that the backup compression / encryption didn’t make the cut in std edition, this should not be just an enterprise feature! So here is a method that we can say bye bye to SQL Injection. Well not completely, but maybe a large percentage of them how you ask… well simple code better… no no really I don’t claim to be a Developer / coder by any means and I would hate to think how hard it would be to cover every hole in a web application that was reasonably sized, in fact it might be near impossible? 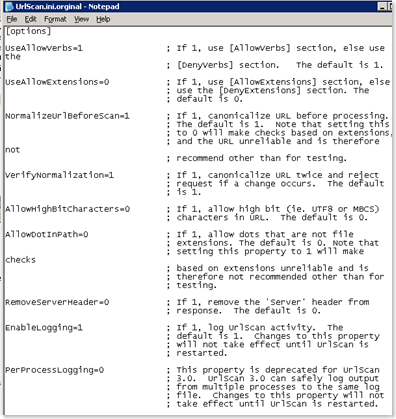 Anyway back to the topic, I was alerted to an application that is called ‘URLScan’ (specifically 3.0 beta) it is a free Microsoft application, that acts as an ISAPI filter for II5.1, IIS6 and IIS7, after reading a bit about it my eyes were starting open wider and wider, the things that you can do with this tiny filter are simply amazing. It is nothing but a simple filter process where you can allow or deny access to file extensions, limit accepted URL length, Allow / deny Verbs, allow / deny access to URLstrings, the list goes on, now yes we can do some of these things in IIS, especially in IIS7 as it has brought a few of these functions to the table by default, but the ease of configuration and the expandability of this just blows using IIS additional security functions out of the water. 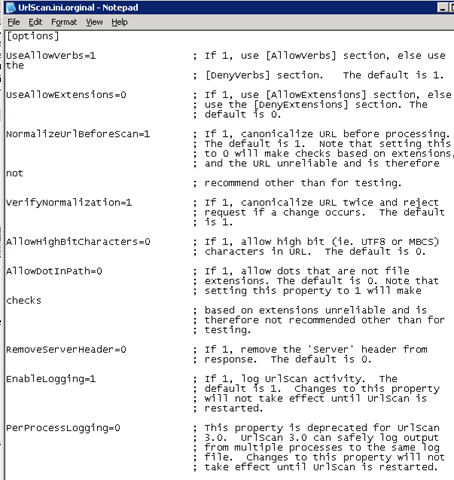 here is a screenshot of the default .ini file as you can see some of the many nifty features in the standard ini file. 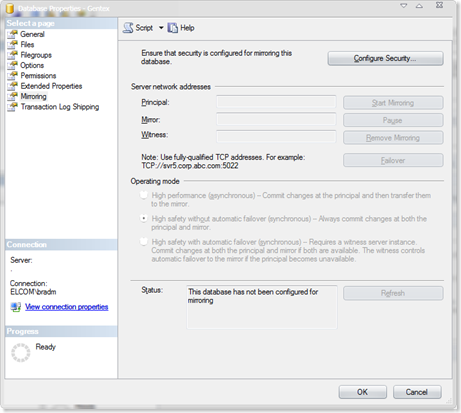 Some you will see that you can already control them in IIS. As you can see it shows URL scan is starting with what is being denied or allowed, the last line shows an entry where an IP address was denied access to a sequence. I mentioned expandability previously, there is just so much you could do with this as an example here is some expandability you could tack into the ScanURL to stop SQL injections, its as simple as copy and paste into your INI file that’s it…. Obviously there are problems with this because chances are that your web app uses some of these within a query string to retrieve the data from the database, but its a great starting point I would suggest running it all on a dev server test, watch the log file and see what is being queried, if you know it is needed then simply comment out the item that was denied, this will then allow it, its a simple process of elimination. The other thing I have found with a considerably amount of SQL injections are they are very long strings, I found a number of Injections and then found the word count on them all, it averaged around 1050 characters, so if you web app doesn’t have extremely long query strings why not reduce the number of allowed characters??? if you do this I do suggest monitoring this to ensure your web app is not in fact generating massive strings. 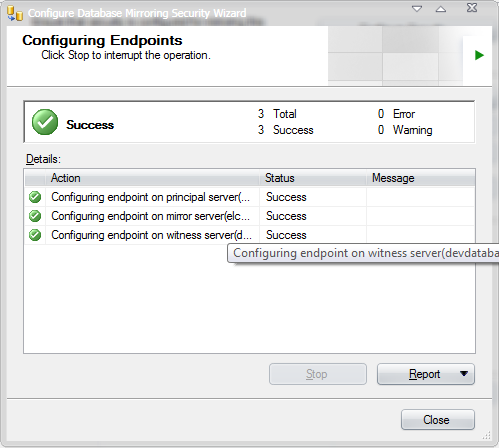 Now we know when Mirroring in the ‘High safety with automatic failover’ mode it will automatic failover, which works superbly, but a few questions for you, are you using SQL authentication for you databases? 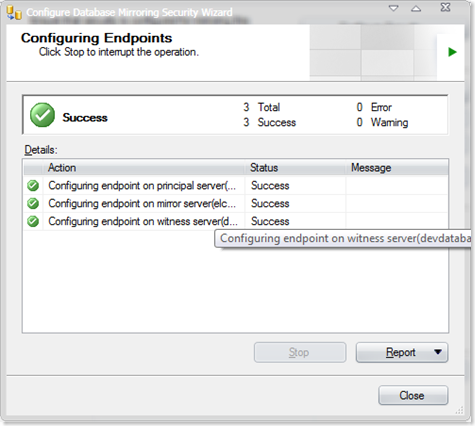 have you tried the failover and then tried to call your app through the failover server now as the principle server? Do you manually change your .config or use a script to do a find and replace if your web application is using a connection string? Lets start with the connection string, now hopefully your application is using .NET 2.0 or above, if it is you will be very happy to know you don’t have to script anything for when a server dies and your mirrored database takes over, for those using 1.1 or below UPGRADE, but if you cant well I under stand, you might want to read another post about a find and replace tool I found that will make your scripting life much easier for the failover it can be found here, anyway back to the .NET 2.0 users, if you are using a mirror then you will be very happy Microsoft have included some additional functionality within the connection string, where you can specify a failover partner, this will allow you to enter the failover’s server name or IP and once the principle mirror has failed you need not worry if you have the failover partner string within the connection string, it will detect this and failover immediately. it works perfectly, try it, you will be amazed. If you use SQL authentication and lets say you take a backup of database and then restore it to another SQL server, what one thing that you will always have to do….? give up… You will have to remove the user and then re-add the user to the database, why because the SID (security Identifier) is different on each SQL server, the same applies to mirroring, when you failover even though you are using the same user and password for the SQL authentication, the app / database will fail to work because once again just like a restore you will have to delete the user and then re-create it, one massive pain in the but, especially if you want automatic failover and then it does failover in the middle of the night, but yet all your databases still fail, now wouldn’t that just be a kick in the face. However we have an easy fix for that, all you need to do is make the failover database SID the same as the principles SID for that user, or all users that you are using for the mirrored databases. So first thing is getting the SID of the principle SQL server. your failover I should now failover quickly and smoothly, without any manual intervention. Repeat this for each database, if you have hundreds of databases, do a SP_database and then copy to excel and then save to CSV and the play with it that way. Well it has occurred to me that there are no real guides to setting up mirroring that deal with what errors you could, or more like you will run into whilst setting up a mirror. So first thing is first the prerequisites. 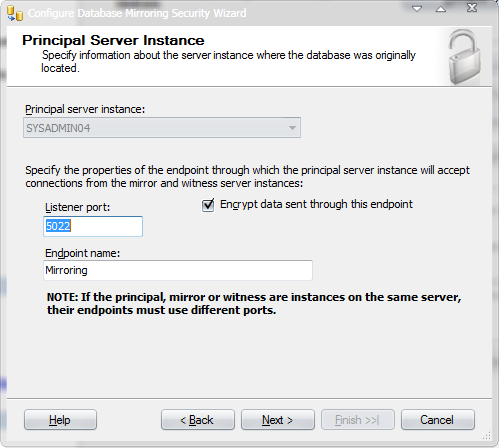 at least SP1 applied, if this is not applied you will get an error saying that this feature is not enabled, you can enable this feature, however I recommend rather then playing with the startup values you patch your MSSQL server to the current SP for SQL. 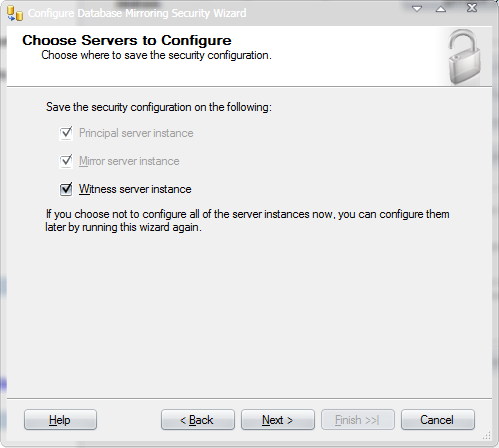 You must have all three SQL servers using an account that has network access, by default most of us will have used the local system account, which in this case is not going to work, you will get this obscure error message when trying to start the mirror. If you get this, right click on your database and go to ‘properties’ then to ‘options’ you can change the mode their. 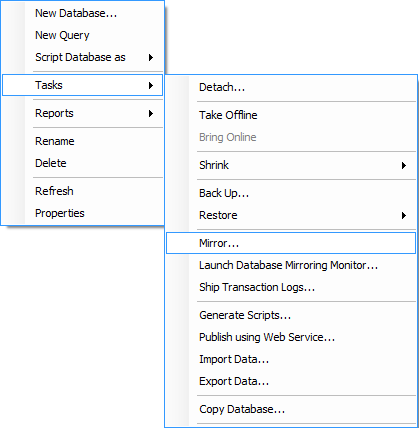 first thing is first, take a full backup of your database that you want to start mirroring, move this backup to a share or somewhere that your failover server can restore the database from. Ok now you should have a database on your failover server and it should be in a ‘restoring’ state, if you are not seeing this then refresh your databases, if you still don’t see then then you probably missed the NORECOVERY part, go back and do this again with NORECOVERY applied. we are halfway there, all you need to do now is again create another backup on the principle server, but this time it must be a transactional backup. So once again create a new transactional backup, place the backup in a place where the fail over server can restore the database from, and then perform your restore again using the NORECOVERY method. Once again you will have a database that should be still in a restoring state. 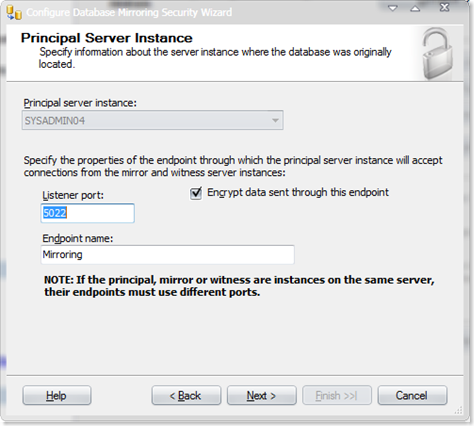 ‘the mirror database …., has insufficient transaction log data to preserver log backup chain of the principle database. Now we are ready to start the mirroring! If you can make successful connections to each then you are good to go. If you tried to start your mirror, and you get an error ‘one or more of the servers network addresses lacks a fully qualified domain name’ that’s an easy one, you must edit the server so it has a FQDN like server.domain.com if your DNS is being painful add it to the host file of the server you are setting the mirror up on. 8:     -- Copyright © 2002 Narayana Vyas Kondreddi. All rights reserved. Once you have ran the SP, you must call it, then within the ‘ ‘ you can type what you are looking for, the execute and wait!